Here is the result of 20 minutes work in Eagle on the VMS board. 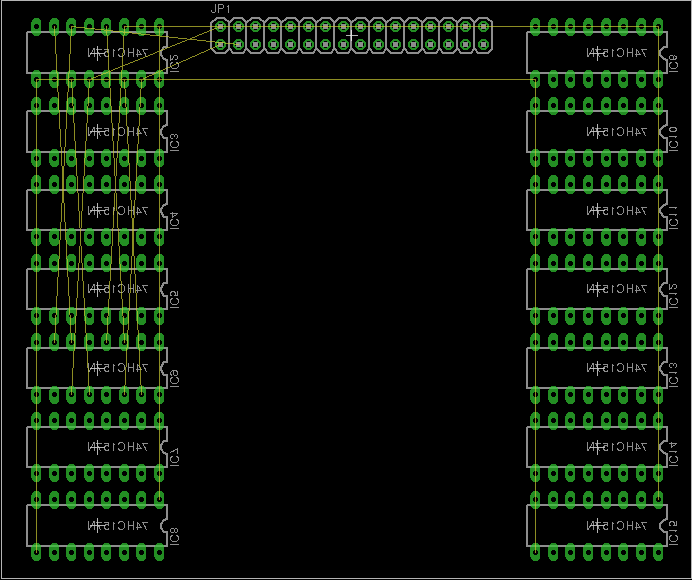 I have place the 14 74HC157 ICs required to form the switching logic. I have also placed a header for connection to the GPU IC. I still have to place a header for each bank of RAM and a header for the RAMDAC IC. It doesn't take a Rocket Scientist to work out that this is not going to work. I'm already at the full board size Eagle support for the free version and I don't have any room for routing traces. Abandon the switch and RAMDAC and have the GPU to it all. Come up with a better switch. The first option doesn't appeal to me greatly. If I lose the switch then I lose the ability to render and scan-out at the same time. This is a big deal. Based on the figures from here, active video accounts for approximately 91% of a full second of video. That leaves only 9% of the AVR CPU time to actually render. My previous design allowed rendering 100% of the time. The second option could be solved with something like a FPGA of CPLD. I need to look into the cost of these. An initial look reveals this one has 120 GPIO pins and is $31. The other cool thing about an FPGA is that I could move the CLEAR SCREEN command to the FPGA and free up the GPU too. The third option appears infeasible at this point. I can find dual-port SRAM at good price. That said, I could de-solder some from an old video card. Hmmm, might look into this. This is the ultimate because it means I can put the GPU and RAMDAC on opposite side of a single RAM IC. This is likely to be a dead end though as I'm pretty sure all most video cards use a derivative of DRAM, and I'm not getting into that.